The WOW Slier is a stand alone code generator similar to NetObjects Fusion except it is specialized to generate the code to display an image slide show. where Fusion saves its project files with a .nod extension WOW saves its project files with a .wowsl extension. The default save/generate folder is going to be located on your computer at: \My Documents\WOW Slider\. Like with all software you can choose to save your project files and generated code anywhere but for the sake of this tutorial we will assume and reference the default location names. This tutorial is not targeted to explaining now the WOW software works but how you get the code it generates from the pages it generates and into NetObjects Fusion where it will display on your web pages. For detailed tutorials on the operation of the WOW software visit their web site or google for information. Since NetObjects Fusion is a code generator, you must insert code within Fusion so that the code becomes part of Fusion, otherwise the next time you generate, if the external code is not part of the Fusion page, the newly Fusion generated page will not have the code on it. As with all graphics, please follow proper cropping, resizing, and compressing rules for the web. The images you use in your side show need to load fast otherwise your visitors will leave before you page loads. Before you get started go over the gotFusion "using graphics on the web" tutorial to understand how to crop, resize, and compress images for use on the web. Make your slide show graphics all the same size before you get started and you will have a better looking slide show. Make your gallery the way you want it with the transition effects and photos you want to use. When you are satisfied with your slide show. This will create an index.html file and all of the folders and files necessary for the WOW slider to function. You will find these documents, files, and folders located in the default WOW folder location outlined above. Open Windows Explorer and navigate to the folder that the WOW software generated its page into. Right click on the index.html file that will be located in that folder and select open with Notepad. Press and hold your control key while you press the T key on your keyboard to bring up the HTML insert dialog box. 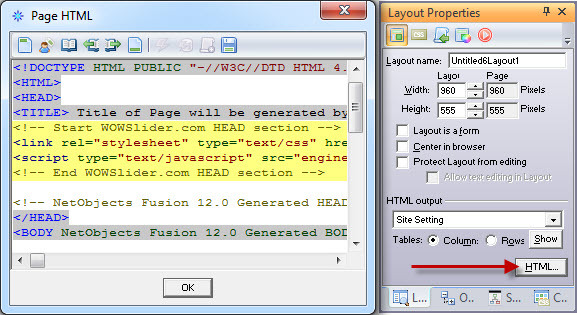 Paste the WOW body code into the HTML insert dialog box and press the OK button to close. Using an external FTP program, log on to your domain and navigate to the location of the page you have placed the WOW code on. If you are publishing by ASSET TYPE, this will be the HTML folder. If you are publishing FLAT this will be your domain root (wwwroot or public_html, ask your web host if you do not know what domain root is called). If you are publishing by SITE STRUCTURE you need to go to the folder of the same name as that page that has the WOW coding on it. You will not see the slide show until you generate the page, either local publish or remote publish. Check the page in a local publish to make sure everything is working before uploading.